When my son was about ten years old we went on holiday to Perth. We didn’t fly, as many people do. We drove from Adelaide where we lived. That’s a distance of 2691.44 km, about twenty-four hours driving time. It takes around three days, even more if you stop along the way. 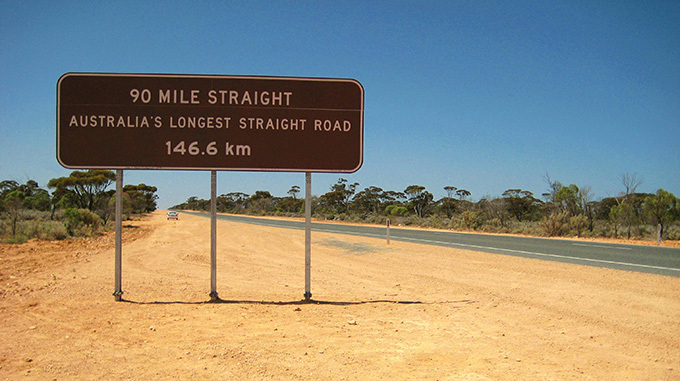 A lot of the drive is on The Eyre Highway which cuts across The Nullabor for 1675Kms. The Nullabor is mostly a flat, dry, treeless plain; there are very long stretches of the road where there doesn’t seem to be much going on. It’s only if you stop and get out of the car that you start to see the micro-variation. Like many Australians, we figured that Driving The Nullabor was an essential part of the Australian experience. We had to do it at least once. I’d grown up with my parents’ stories of the drive. They regularly braved the distance in the days when the highway wasn’t paved. Then, it was just red dirt. A youthful Mum and Dad, together with my maternal uncle and paternal grandfather, lived in Kalgoorlie, a mining town outside of Perth, and they all went home to Adelaide a couple of times a year. Across The Nullabor in a trusty Ford. My father was one of those Australian blokes who could fix anything, so he was usually able to deal with the inevitable mechanical problems that occurred during the then five to six-day trip. However, on one such trip, the windscreen broke – always a possibility on unmade roads – and Mum and my uncle spent the best part of a day trying to stop the thick red dust from filling up the car. They finally got to a petrol station where Dad was able to make a temporary repair strong enough to go the distance. The way they told it, this was both adventurous and hilarious. I’m sure it was actually terrible. But when we did the trip, the highway was paved. ‘Roughing it’, a la parents, was unlikely. But there were still hazards. 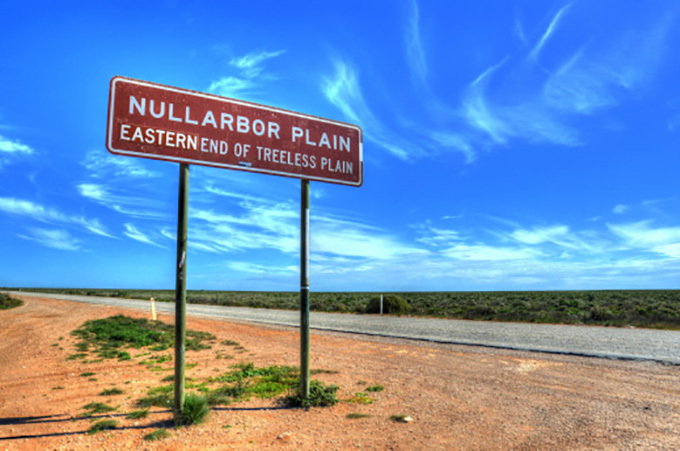 The Nullabor can be dangerous simply because drivers get tired and don’t stop when they need to. ‘Straight road’ crashes are common. Cars can break down even if they are checked immediately before travelling, as ours was. We carried lots of water and supplies in case we got stranded; we could sleep and cook in the van if we needed to. But the most likely risk of an accident came from the wildlife. Kangaroos regularly appear out of nowhere, particularly from dusk to dawn. Roos often come for the grass at the side of the road and the moisture on the bitumen, condensation produced by the desert temperature rapidly dropping as the sun goes down. We had a ‘roo bar’ fitted to our van to lessen potential damage, but we still took the precaution of stopping well before sunset. Two days of driving across the Nullabor are pretty tiresome for a small-ish person. We had a repertoire of car games, but these were seriously challenged by the sheer distance and apparently same-y landscape. “I spy” and its variations was usually a favorite car-game. But there was only so much S is for Saltbush we could do. And there was often so little traffic on the road that we couldn’t really guestimate the make, colour or model of cars we would see. The dominant traffic on the Eyre Highway is haulage. Massive trucks carry consumer goods from one side of the country to the other and they travel through day and the night in ‘road trains’. T is for Truck wore thin pretty quickly too. 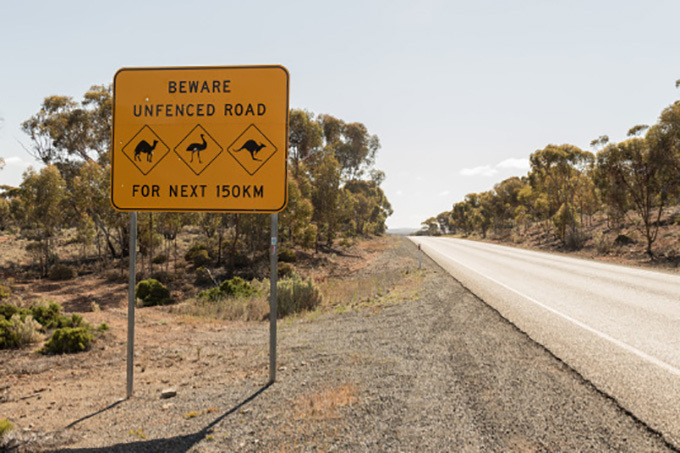 Now, the side of the Nullabor road, the unpaved ‘shoulder’, is testimony to the power and size of the truck compared to the kangaroo. Road kill. Road kill in abundance. I remember at one point being reduced to playing “Guess how many dead kangaroos I spy on the side of the road in the next five kilometres”. Ghoulish, but effective. But why am I telling you all this? Well, the analogy is pretty obvious. Reading a thesis can be a little – or a lot – like travelling on a very long highway. Think of the thesis as The Nullabor Plain. Without the writer intending it, a thesis can actually be pretty flat and same-y. Readers can be lulled to sleep – or bored to the point of putting the text away – by the sheer monotony of the prose. There is a repetitive quality to the text which is, ultimately, soporific. But thesis writers don’t want their examiners to get tired, breakdown or crash into the unexpected textual kangaroo. So they need writing which keeps the reader interested. And this doesn’t come straight away. First drafts are about getting the material and the argument lined up. Creating an interesting text takes revision. A lot of revision. And the thesis writer therefore needs to build strategies that focus specifically on increasing textual liveliness/reducing textual boredom. These revision strategies require careful critical reading – a textual game of “I Spy” to spot the things which might send a thesis reader to sleep and/or crash and burn. I’m starting a new series of posts about these revision strategies. These posts are geared to helping thesis writers avoid unnecessary reader-examiner slumber. I’ll l cover flabbiness, incoherence and dullness. Less evocatively, this means I’m going to look at expression, repetition and flow. And each of these involves more than one thing. For instance, revising to avoid repetition involves looking at how sentences begin and end, the position of the subject and verb, whether the sentences are the same length and structure, and paragraph lengths. Hours of fun ahead. These revision posts won’t come one after the other. Nor will they come regularly – say every Monday. That’s because I want to avoid the problem I’m addressing. A blogger doesn’t want to create The Nullabor experience any more than a thesis writer. Readers are kept interested in thesis texts and in blogs because of their variation. So these posts will appear over the next few months, but not all at once. I will use a common hashtag for the posts – #wakeupreader – so you will know them when you see them and can find them later. I hope they will be useful. Oh – and parents take note – the Nullabor road trip produced strong long-term memories, and perhaps not just for me … album cover Virgin Records, 2000.